Fanny Pearl Baker age 87 of Garrett, Indiana passed away peacefully on July 23, 2015. She had been a resident of Kendallville Manor for the final stretch of her life. Fanny was born in Moultrie County, Illinois on January 16, 1928 to William Andrew and Veda (Poland) Selock. 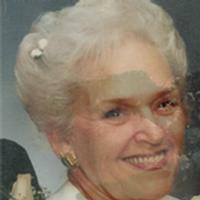 She is predeceased by her parents, siblings and her husband of 66 years, Billy Baker. She is survived by her five children: Veda Kay Chambers, Rebecca Kiles, Angelia Kochert, John Andrew Baker, and Joel Scott Baker as well as her twelve grandchildren, several great-grandchildren, and one great-great grandchild. Fanny was an artistic person. When her children were young, she created and painted themed bedrooms for them. She later began to paint landscapes and portraits. Fanny and Bill also enjoyed producing craft items as gifts for friends and family. Known for her generous hospitality, Fanny's home was frequently filled with family and friends and she was always delighted to receive company whenever they would happen to drop by. She was a faithful member of DeKalb County Church of Christ and served there diligently and joyfully. She was a frequent volunteer with excellent organizational abilities. In earlier years she served as the president of PTA in the Garrett School system and organized and facilitated an annual fish fry fundraiser. She was always willing to pitch in and lend a hand wherever she was needed. Her children wish to thank the staff at Kendallville Manor for the continual care and support they have given, both to Bill and Fanny in these past years. We appreciate you very much. Visitation will take place on Saturday, July 25, 2015 from Noon - 2 p.m. at Thomas Funeral Home, 1277 C.R. 56, Garrett, IN with services taking place at 2 p.m. with Ed McDowd officiating. Memorials are to DeKalb County Church of Christ.